So January is done and with that my resolution of no-refined sugar has also come to and end. Doing sugar-free January was challenging but not as difficult as I thought it would be. I definitely missed my chocolate and my cookies with chai but other than that I was pretty okay without the sugar. 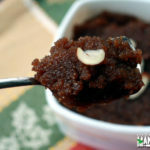 I was still eating occasional dates, jaggery so I think that made it easy. If I would have restricted myself from natural sugars too, then I am sure I wouldn’t have been able to complete the challenge. Doing sugar-free January made me appreciate healthier desserts. In fact I was able to make quite a few treats at home which were much better than those loaded with refined sugar. And honestly, healthy desserts can be delicious too. 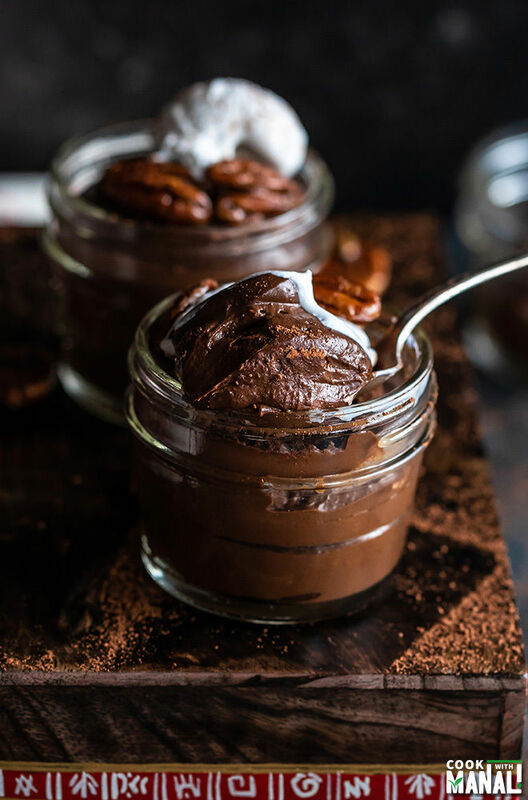 Case in point, this Chocolate Avocado Pudding. It’s so creamy and chocolat-y, you would never believe that there are avocados in there! ✓ a healthier treat to satisfy those sweet cravings! Like I said, this is actually very good. Sarvesh doesn’t eat any healthy dessert. He has this pre-conceived notion that healthy desserts = awful taste. But he loved this chocolate avocado pudding. In fact, I asked him to guess what was in the pudding and he could not guess that there were avocados in there. Let me assure you guys, you can’t taste the avocados at all. If you will not tell, no one will know. All you need is 10 minutes and few simple ingredients to make this dessert. It all gets done in a food processor with in minutes. You then just chill the dessert and enjoy. It becomes thicker and creamier as it chills. I would highly recommend using a good quality cocoa powder here. 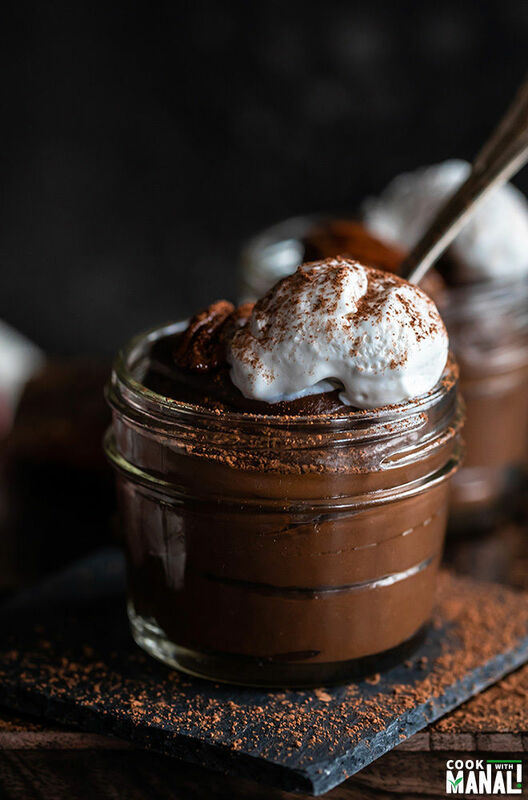 The taste of the pudding depends so much on the cocoa powder so it’s important that you use a good one. My recommendation in Anthony’s Cocoa Powder. I love that stuff! But really any good cocoa powder that you like will work. And now coming to the Maple Cinnamon Pecans! Because the pudding is so creamy, I wanted to add some crunch to it and also do some garnishing to make it extra special. It’s these little additions that can make a dessert extra-special. Isn’t it? 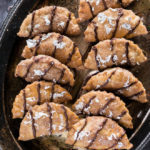 These maple cinnamon pecans add the right sweetness and crunch to the pudding and you wouldn’t want to miss out on these. This dessert can be made well in advance. 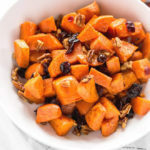 Refrigerate it overnight and serve next day. It will be perfect. You can top it some coconut whipped cream or regular whipped cream (if you don’t care about it being vegan). Honestly, I feel this chocolate avocado pudding tastes best as such. With the maple pecans on top! Mmm! 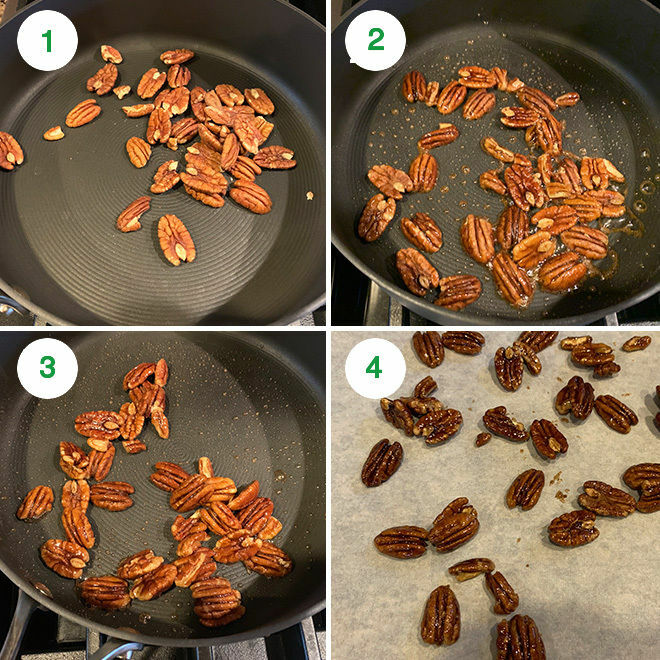 1- To make maple cinnamon pecans, start by roasting the pecans in a pan on medium heat for 2 to 3 minutes until fragrant. 2- Remove pan from heat, add maple syrup and cinnamon powder and stir. Place the pan back on heat. 3- Stir until all liquid is absorbed, it will take around 1 minute. 4- Transfer pecans onto a parchment paper to cool down. They will not stick once cooled. 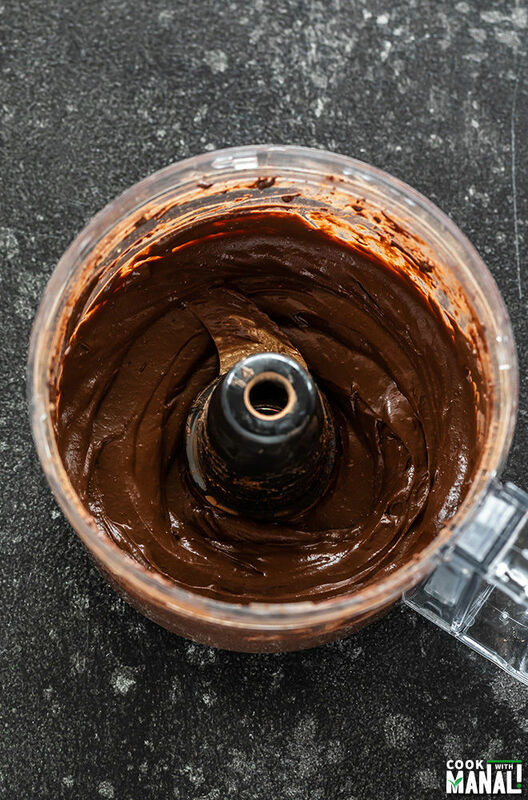 5- To make the pudding, to a food processor add avocado, cocoa powder, vanilla extract, cinnamon powder, pinch of salt, maple syrup and cashew milk. 6- Pulse until it’s all smooth and creamy. You may need to scrape the sides in between. 7- Transfer pudding to small bowls or mason jars. Chill for an hour or two. 9- Serve topped with maple cinnamon pecans. You can also garnish with coconut whipped cream. 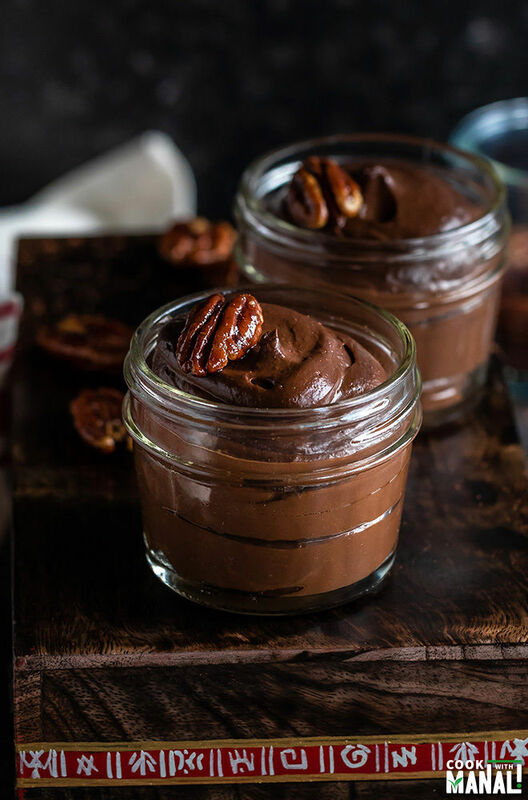 This Chocolate Avocado Pudding tastes better after chilling for few hours, so don’t forget to chill it before serving! 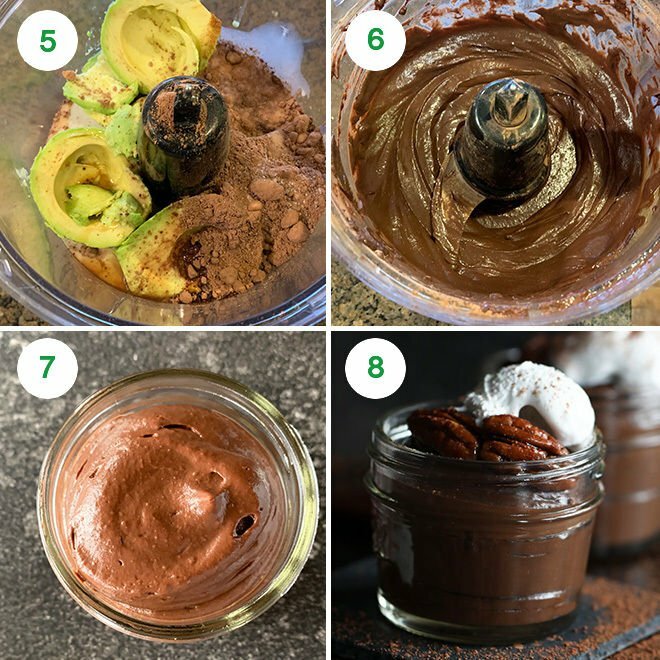 If you’ve tried this Chocolate Avocado Pudding Recipe then don’t forget to rate the recipe! You can also follow me on Facebook and Instagram to see what’s latest in my kitchen! 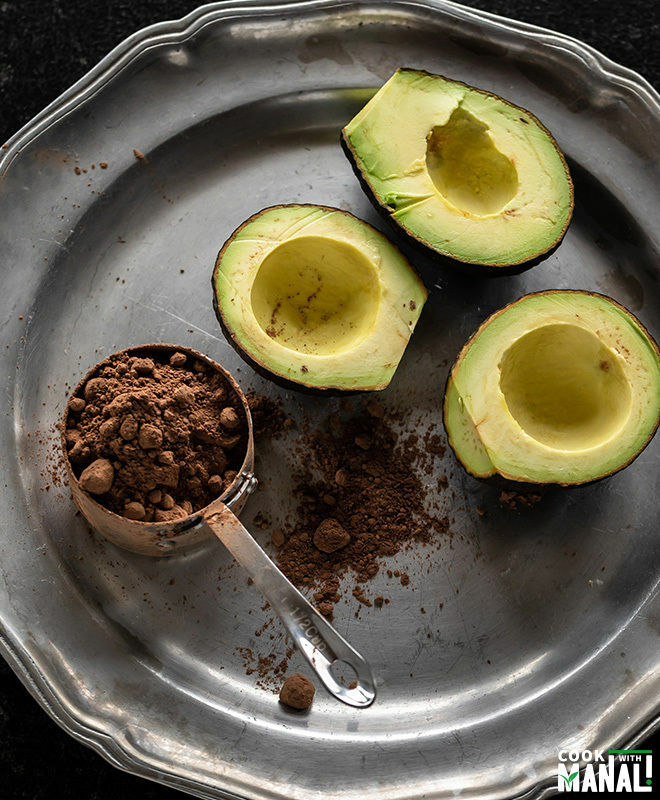 Vegan & free of refined-sugar, this creamy Chocolate Avocado Pudding gets done in 10 minutes! The maple cinnamon pecans on top make it extra-special! To make maple cinnamon pecans, start by roasting the pecans in a pan on medium heat for 2 to 3 minutes until fragrant. Remove pan from heat, add maple syrup and cinnamon powder and stir. Place the pan back on heat. Stir until all liquid is absorbed, it will take around 1 minute. Transfer pecans onto a parchment paper to cool down. They will not stick once cooled. To make the pudding, to a food processor add avocado, cocoa powder, vanilla extract, cinnamon powder, pinch of salt, maple syrup and cashew milk. Pulse until it's all smooth and creamy. You may need to scrape the sides in between. Transfer pudding to small bowls or mason jars. Chill for an hour or two. Serve topped with maple cinnamon pecans. You can also garnish with coconut whipped cream. 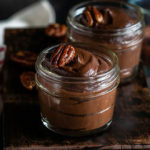 This Chocolate Avocado Pudding tastes better after chilling for few hours, so don't forget to chill it before serving! Do remember to chill the pudding for 2 to 4 hours before serving. The pudding tastes best when chilled. You may also sweeten the pudding with honey if you like. Can I use regular milk if I am not vegan and also omit the cinnamon? My husband isnt too fond of cinnamon, so any alternatives to that?